Ambassador (Ret.) Ford Fraker – Senior Adviser and Chairman for the Middle East and North Africa Group, Kohlberg Kravis Roberts & Co. L.P.; former U.S. Ambassador to the Kingdom of Saudi Arabia. GLOBAL EDUCATIONAL CHALLENGES: WHAT FUTURE ARAB EMPLOYMENT PROSPECTS? 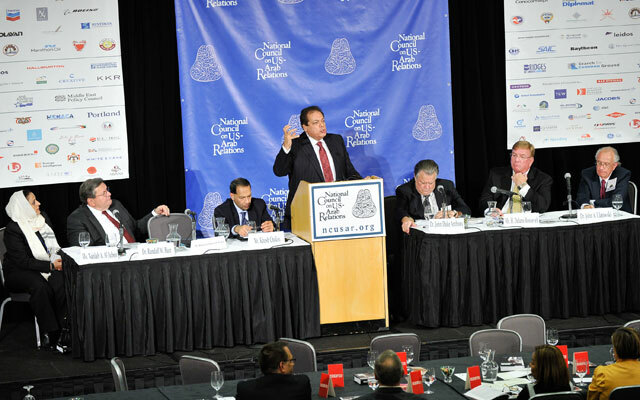 Distinguished Lifetime Achievement Award – 2010 Arab-U.S. Policymakers Conference from NCUSAR on Vimeo. Chair: Ms. Harriet Fulbright − President of the J. William and Harriet Fulbright Center, a non-profit organization which serves to continue Ms. Fulbright’s life’s work in global education and to advance the work of her husband, former longtime U.S. Senate Foreign Relations Committee Chairman and National Council on U.S.-Arab Relations National Advisory Board Chairman Senator J. William Fulbright. The Hon. Theodore H. Kattouf − President and Chief Executive Officer, AMIDEAST – America-Mideast Education and Training Services; former United States Ambassador to the United Arab Emirates (1998-2001) and Ambassador to Syria (2001-2003); career Foreign Service Officer serving as Deputy Chief of Mission in Damascus, Syria and Riyadh, Kingdom of Saudi Arabia. Dr. Juan R.I. Cole − Richard P. Mitchell Collegiate Professor of History, University of Michigan; author of, among other works, Engaging the Muslim World, Napoleon’s Egypt: Invading the Middle East, and Sacred Space and Holy War: The Politics, Culture and History of Shi`ite Islam; blog author, “Thoughts on the Middle East, History, and Religion;” President, Global Americana Institute. Dr. Mody Al-Khalaf − Director of Cultural and Social Affairs, Saudi Cultural and Educational Mission, Embassy of Saudi Arabia in Washington DC;former Professor of Linguistics, Princess Nora University, Prince Sultan University and The Arab Open University, Riyadh; Editor-in-Chief, Al-Mubtaath, a monthly magazine launched in 1978 by the Saudi Cultural Mission covering a range of topics of interest to Saudi students in the United States. Dr. Abdulrahman H. Al-Saeed − Advisor to The Royal Court of the Kingdom of Saudi Arabia and Director, Office of Special Projects for HRH King ‘Abdallah Bin ‘Abdalaziz Al Sa’ud, Custodian of the Two Holy Places and King of Saudi Arabia.